AudioTools 6.9 is on the App Store, which includes support for recalling and displaying multiple plots in Smaart Spectrum and Transfer function, and more. AudioTools Wireless is now available! The app functions as a wireless microphone and a remote-controlled generator for AudioTools and other Studio Six Digital apps. 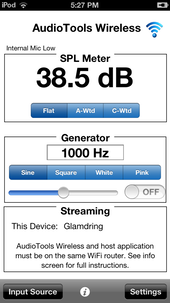 AudioTools Wireless uses the local WiFi network to send uncompressed digital audio and calibration data to AudioTools running on another iOS device. Connect iTestMic, iAudioInterface2, or any other audio source to an iOS device running AudioTools Wireless, and connect to that mic over WiFi from another iOS device on the same network.